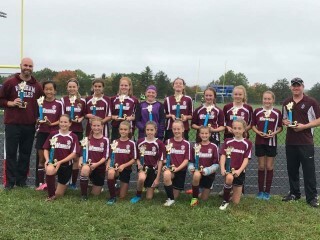 The Windham U13 Girls’ Soccer Team won the State Regional Championship for the second consecutive year this October. I spoke with one of the coaches, Jason Dakin about the team, the girls and winning it all twice in a row. Last season, the U13 girls had 11 players which made it hard on them energy-wise because they needed nine players on the field. Despite the fact that although as a team, they might have been a little worn out come the second half of game play, they still were undefeated and were a team other teams recognized as good. When they made it to the championship last year, the girls were a bit nervous. However, as the game went on, they picked up the pace as a team and before they knew it, it was 3-0. That game ended with Windham winning 5-2. The U13 girls had won the championship. That season ended with the girls winning 15 games and going undefeated. This year the girls’ confidence had risen because of the success of last year. The team added five more team members, which took some of the pressure off when it came to substituting players. They continued to be a strong team and other teams knew they had to step it up to beat them, and even then, Windham would still win! The Captains told the team, “We got this. Everyone wants to beat us and if we keep playing like we are, no one will be able to.” And those other teams couldn’t. The girls weren’t as nervous going into the state championship game. All their hard work had culminated in another state championship win - for the second year in a row. The Windham Girls U13 Soccer Team was a good, strong team and had gone another season undefeated. Although they were a team that loved to win, and were good at it, “They were [also] there to have fun.” said Dakin.